The Campeonato Nacional de Liga de Primera División,[a] commonly known as La Liga[b] (La Liga Santander for sponsorship reasons with Santander), is the men's top professional football division of the Spanish football league system. Administered by the Liga Nacional de Fútbol Profesional (English: National Professional Football League), also known as the Liga de Fútbol Profesional (LFP), La Liga is contested by 20 teams, with the three lowest-placed teams at the end of each season relegated to the Segunda División and replaced by the top three teams in that division. The competition format follows the usual double round-robin format. During the course of a season, which lasts from August to May, each club plays every other club twice, once at home and once away, for 38 matchdays. Teams receive three points for a win, one point for a draw, and no points for a loss. Teams are ranked by total points, with the highest-ranked club at the end of the season crowned champion. If the tie is still not broken, it will be resolved with a tie-break match in a neutral stadium. The top 4 teams in La Liga qualify for the subsequent season's UEFA Champions League Group Stage. The winners of the UEFA Champions League and UEFA Europa League also qualify for the subsequent season's UEFA Champions League Group Stage. If this means 6 La Liga teams qualify, then the 4th place team in La Liga instead plays in the UEFA Europa League, as any single nation is limited to a maximum of 5 teams. The 5th place team in La Liga qualifies for the subsequent season's UEFA Europa League Group Stage. The winner of the Copa del Rey also qualifies for the subsequent season's UEFA Europa League Group Stage, but if the winner also finished in the top 5 places in La Liga, then this place reverts to the team that finished 6th in La Liga. Furthermore, the 6th place (or 7th if 6th already qualifies) team qualifies for the subsequent season's UEFA Europa League 2nd Qualifying Round. The number of places allocated to Spanish clubs in UEFA competitions is dependent upon the position a country holds in the UEFA country coefficients, which are calculated based upon the performance of teams in UEFA competitions in the previous 5 years. Currently the ranking of Spain (and de facto La Liga) is 1st. In addition, the winners of the UEFA Champions League and UEFA Europa League automatically qualify for the group stage of the UEFA Champions League in the subsequent season. A maximum of 5 teams are allowed from any one association, so if 6 teams qualify for the UEFA Champions League, the 4th place team in the domestic league competes in the UEFA Europa League. In April 1927, José María Acha, a director at Arenas Club de Getxo, first proposed the idea of a national league in Spain. After much debate about the size of the league and who would take part, the Real Federación Española de Fútbol eventually agreed on the ten teams who would form the first Primera División in 1929. Barcelona, Real Madrid, Athletic Bilbao, Real Sociedad, Arenas Club de Getxo and Real Unión were all selected as previous winners of the Copa del Rey. Atlético Madrid, Espanyol and Europa qualified as Copa del Rey runners-up and Racing de Santander qualified through a knockout competition. Only three of the founding clubs, Real Madrid, Barcelona and Athletic Bilbao, have never been relegated from the Primera División. Although Barcelona won the very first Liga in 1929 and Real Madrid won their first titles in 1932 and 1933, it was Athletic Bilbao that set the early pace winning Primera División in 1930, 1931, 1934 and 1936. They were also runners-up in 1932 and 1933. 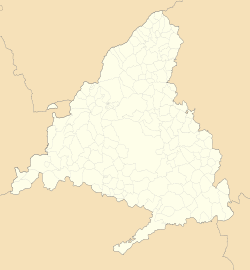 In 1935, Real Betis, then known as Betis Balompié, won their only title to date. Primera División was suspended during the Spanish Civil War. In 1937, the teams in the Republican area of Spain, with the notable exception of the two Madrid clubs, competed in the Mediterranean League and Barcelona emerged as champions. 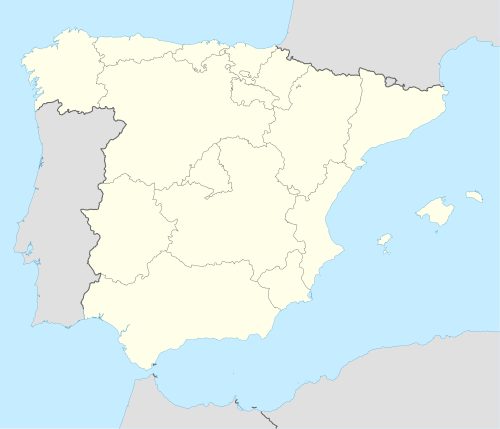 Seventy years later, on 28 September 2007, Barcelona requested the Royal Spanish Football Federation (Spanish acronym RFEF) to recognise that title as a Liga title. This action was taken after RFEF was asked to recognise Levante FC's Copa de la España Libre win as equivalent to Copa del Rey trophy. Nevertheless, the governing body of Spanish football has not made an outright decision yet. When the Primera División resumed after the Spanish Civil War, it was Atlético Aviación (nowadays Atlético Madrid), Valencia, and FC Barcelona that emerged as the strongest clubs. Atlético were only awarded a place during the 1939–40 season as a replacement for Real Oviedo, whose ground had been damaged during the war. The club subsequently won their first Liga title and retained it in 1941. While other clubs lost players to exile, execution, and as casualties of the war, the Atlético team was reinforced by a merger. The young, pre-war squad of Valencia had also remained intact and in the post-war years matured into champions, gaining three Liga titles in 1942, 1944, and 1947. They were also runners-up in 1948 and 1949. Sevilla also enjoyed a brief golden era, finishing as runners-up in 1940 and 1942 before winning their only title to date in 1946. Meanwhile, on the other side of Spain, FC Barcelona began to emerge as a force under the legendary Josep Samitier. A Spanish footballer for both Barcelona and Real Madrid, Samitier cemented his legacy with Barcelona. During his playing career with them, he scored 333 goals, won the inaugural La Liga title and five Copa Del Rey. In 1944, Samitier returned to Barcelona as a coach and guided them in winning their second La Liga title in 1945. 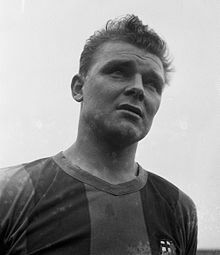 Under Samitier and legendary players Cesar Rodriguez, Josep Escola, Estanislau Basora and Mariano Gonzalvo, Barcelona dominated La Liga in the late 1940s, winning back to back La Liga titles in 1948 and 1949. The 1940s proved to be a successful season for Barcelona, winning three La Liga titles and one Copa Del Rey, but the 1950s proved to be a decade of dominance, not just from Barcelona, but from Real Madrid. The 1950s also saw the beginning of the Real Madrid dominance. During the 1930s, 1940s, and 1950s, there were strict limits imposed on foreign players. In most cases, clubs could only have three foreign players in their squads, meaning that at least eight local players had to play in every game. During the 1950s, however, these rules were circumvented by Real Madrid who naturalized Alfredo Di Stéfano and Ferenc Puskás. 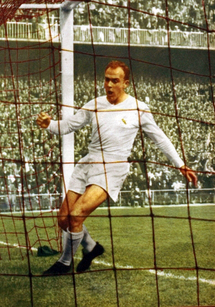 Di Stéfano, Puskás, Raymond Kopa and Francisco Gento formed the nucleus of the Real Madrid team that dominated the second half of the 1950s. Madrid won the first division in 1954, 21 years later since 1933, and retained its title in 1955. They were winners again in 1957 and 1958, with only Athletic Bilbao interrupting their sequence. All in all, Barcelona and Real Madrid won 4 La Liga titles each, with Atletico De Madrid and Atletico De Bilbao winning one each during this decade. Between 1961 and 1980, Real Madrid dominated the Primera División, being crowned champions 14 times, including five in a row from 1961 to 1965 and two three-in-a-row sequences (1967–1969 and 1978–1980). However, their only European Cup triumph during this period came in 1966, a sharp contrast to their five successive victories in the competition from 1956. During this era, only Atlético Madrid offered Real Madrid any serious challenge, adding four more titles in 1966, 1970, 1973, and 1977. Of the other clubs, only Valencia in 1971 and the Johan Cruyff-inspired Barcelona of 1974 broke the dominance of Real Madrid. The Madrid winning sequence was interrupted more significantly in 1981 when Real Sociedad won their first-ever title. They retained it in 1982, and there were followed by fellow Basque team Athletic Bilbao, who won back-to-back titles in 1983 and 1984. Terry Venables led Barcelona to a solitary title in 1985 before Real Madrid put together another five in a row sequence (1986–1990) with a team guided by Leo Beenhakker and including Hugo Sánchez and the La Quinta del Buitre – Emilio Butragueño, Manolo Sanchís, Martín Vázquez, Míchel and Miguel Pardeza. Johan Cruyff returned to Barcelona as manager in 1988, and assembled the legendary Dream Team. When Cruyff took hold of this Barcelona side they had won only two La Liga titles in the past 11 years. Cruyff, who knew the history of FC Barcelona as a player, did not want history to repeat itself. He decided to build a team composed of international stars and La Masia graduates in order to restore Barcelona to their former glorious days. This team was formed by international stars such as Brazilian legend Romario, Denmark's magician Michael Laudrup, Bulgarian forward Hristo Stoichkov, Dutchman Ronald Koeman, and Spaniards Andoni Zubizarreta and Jose Mari Bakero. Cruyff's Dream Team also consisted of La Masia graduates Pep Guardiola, Albert Ferrer, and Guillermo Amor. Johan Cruyff changed the way modern football was played and incorporated the principles of ‘Total Football’ into this team. The success of possession-based football was revolutionary and Cruyff's team won their first European Cup in 1992 and four consecutive La Liga titles between 1991 and 1994. In total, Cruyff won 11 trophies in eight years, making him the most successful manager in Barcelona's history until the record was broken by his protégé Pep Guardiola two decades later. Barcelona's run ended with Real Madrid winning La Liga in 1995. Atlético Madrid won their ninth Primera División title in 1996 before Real Madrid added another Liga trophy to their cabinet in 1997. After the success of Cruyff, another Dutchman – Ajax manager Louis van Gaal – arrived at the Camp Nou, and with the talents of Luís Figo, Luis Enrique, and Rivaldo, Barcelona won the La Liga title in 1998 and 1999, included their fourth double of Liga and the Copa Del Rey in 1998. As Primera División entered a new century, the two giants of Spain, Real Madrid and Barcelona, found themselves facing new challengers. Between 1999/00 and 2004, Deportivo La Coruña finished in the top three on ten occasions, a better record than either Real Madrid or Barcelona, and in 2000, under Javier Irureta, Deportivo became the ninth team to be crowned champions. Valencia were also a fierce team in the 2000s and under the management of Héctor Cúper, Valencia finished as Champions League runners-up in 2000 and 2001. His successor, Rafael Benítez, built on this and led the club to a Liga title in 2002, as well as winning the UEFA Cup and La Liga in 2004. Real Madrid won two Liga titles in 2001 and 2003 and also the UEFA Champions League in 2000 and 2002. With world-class players like Raúl, Ruud van Nistelrooy and Gonzalo Higuaín, Real Madrid won back-to-back La Liga titles in 2006–07 and 2007–08. All in all, Madrid won 4 La Liga's and two champions league from 2000-2010. The 2000s also continued the success of FC Barcelona. In the 2004–05 season, Barcelona won their first title of the new century under the brilliance of Ronaldinho. Barcelona retained the title and won it again in the 2005-2006 season, as well as winning the UEFA Champions League against Arsenal, achieving their second European Double. Under the era of Pep Guardiola, powered by La Masia's talent, such as Lionel Messi, Xavi and Andrés Iniesta, Barcelona added three straight Liga titles in 2008, 2009 and 2010. FC Barcelona also became the first team in Spain to achieve the Treble in the 2008/09 season, winning all three major competitions in a single season consisting of La Liga, Copa Del Rey and the Champions League. From 2000-2010, FC Barcelona won 5 La Liga titles and 2 Champions League. In the 2011–12 season, Real Madrid won its 32nd title under the management of José Mourinho with records at the time of 100 points, 118 goals scored, and overall (32) and away (16) wins in a La Liga season. A year later in the 2012-2013 season, Barcelona replicated the same feat under coach Tito Vilanova, matching the 100-point record. Atlético Madrid won the 2013–14 title, their first in 18 years, and the first title in ten years that Real Madrid or Barcelona had not won. In the 2014–15 season, under the deadly trio of Messi, Neymar, and Suarez nicknamed 'MSN', Barcelona made history by becoming the first team to achieve a second treble. MSN hit a record-breaking 122 goals, eclipsing the 118 goals scored by Madrid in the 2011–12 season. Barcelona continued their dominance in the 2015–16 season, winning the Liga/Copa Del Rey double, resulting in 4 titles in 6 years. Real Madrid brought back the La Liga title under the management of Zinedine Zidane in 2016–17, but Barcelona won the title in the 2017–18 season, as well as winning their eighth double, for a total of 7 La Liga titles in 10 years. 20 teams contest the league in its current season, including the top 17 sides from the 2017–18 season and three promoted from the 2017–18 Segunda División. The promoted clubs include Rayo Vallecano and Huesca, promoted directly from the second division, and the winner of the promotion play-off, Valladolid. The Primera División is currently first in the UEFA rankings of European leagues based on their performances in European competitions over a five-year period, ahead of England's Premier League, Italy's Serie A, and Germany's Bundesliga in fourth. Real Madrid, Barcelona and Valencia are in the top ten most successful clubs in European football in terms of total European trophies. These three clubs, along with Sevilla and Atlético Madrid, are five of the most successful teams in European competition history; these five are the only Spanish clubs to have won five or more international trophies. Deportivo La Coruña are the joint fifth-most participating Spanish team in the Champions League with Sevilla — after Real Madrid, Barcelona, Valencia and Atlético Madrid — with five Champions League appearances in a row, including a semifinal appearance in 2003–04. In 2005–06, Barcelona won the Champions League and Sevilla won the UEFA Cup, making La Liga the first league to do the European "double" since 1997. This feat was repeated in 2014, 2015, 2016, and 2018. On 25 August 2015, La Liga became the first league to classify five teams for the UEFA Champions League group stage (Atlético Madrid, Barcelona, Real Madrid, Sevilla and Valencia). Performance comparison of top teams since 2000. The all-time La Liga table is an overall record of all match results, points, and goals of every team that has played in La Liga since its inception in 1929. The table is accurate as of the end of the 2017–18 season. Teams in bold are part of the 2018–19 La Liga. Note: Despite finishing the season in the 13th position in the 2014-15 La Liga, on 5 June, Elche was relegated to Segunda División due to its financial struggles, Newcomers Eibar, who finished the season in the 18th position, took Elche's place in 2015–16 La Liga. In La Liga, players can claim citizenship from the nation their ancestors came from. If a player does not have European ancestry, he can claim Spanish citizenship after playing in Spain for five years. Sometimes, this can lead to a triple-citizenship situation; for example, Leo Franco, who was born in Argentina, is of Italian heritage yet can claim a Spanish passport, having played in La Liga for over five years. In addition, players from the ACP countries — countries in Africa, the Caribbean, and the Pacific that are signatories to the Cotonou Agreement — are not counted against non-EU quotas due to the Kolpak ruling. Until the 2008–09 season, no official individual awards existed in La Liga. In 2008–09 season, the LFP governing body created the LFP Awards (now called La Liga Awards), awarded each season to individual players and coaches. Additional awards relating to La Liga are distributed, some not sanctioned by the LFP or RFEF and therefore not regarded as official. The most notable of these are four awarded by Spain's largest sports paper, Marca, namely the Pichichi Trophy, awarded to the top scorer of the season; the Ricardo Zamora Trophy, for the goalkeeper with the fewest goals allowed per game (minimum 28 games); the Alfredo di Stéfano Trophy, for the player judged to be the best overall player in the division; and the Zarra Trophy, for the top scorer among Spanish domestic players. Since the 2013–14 season, La Liga has also bestowed the legendary monthly manager of the month and player of the month awards. The first La Liga player to be involved in a transfer which broke the world record was Luis Suárez in 1961, who moved from Barcelona to Internazionale for £152,000 (£3.3 million in 2018). Twelve years later, Johan Cruyff was the first player to join a La Liga club for a record fee, £922,000 (£11.0 million in 2018) from Ajax to Barcelona. In 1982, Barcelona again set the record by signing Diego Maradona from Boca Juniors for £5 million (£17 million in 2018). Real Betis set the world record in 1998 when they signed Denílson from São Paulo for £21.5 million (£37.2 million in 2018). Four of the last six world transfer records have been set by Real Madrid, signing Luís Figo, Zinedine Zidane, Cristiano Ronaldo (plus a deal for Kaká days before Ronaldo which fell just below a world record due to the way the fee was calculated) and finally Gareth Bale, who was bought in 2013 for £85.3m (€103.4m or $140m at the time; £96.0m in 2018) from Tottenham Hotspur. The Brazilian forward Neymar was the subject of an expensive and complicated transfer arrangement when he joined Barcelona from Santos in 2013, and his outgoing transfer to Paris Saint-Germain in 2017 set a new world record fee at €222m via his buyout clause. Barcelona soon invested a large amount of the money received from this transfer in a replacement, Ousmane Dembélé, whose deal – €105m – was the second most expensive ever before Philippe Coutinho's transfer to Barcelona for €142m in January 2018. Boldface indicates a player still active in La Liga. ^ Spanish: [kampeoˈnato naθjoˈnal de ˈliɣa ðe pɾiˈmeɾa ðiβiˈsjon]; "First Division National League Championship"
^ English: /læ ˈliːɡə/, Spanish: [la ˈliɣa]; "The League"
^ "La Liga". Oxford Dictionaries. Oxford University Press. Retrieved January 13, 2019. ^ "Campeonato Nacional de Liga de Primera División" (in Spanish). RFEF. Retrieved 15 November 2018. ^ "Attendances in India, China and the USA catching up with the major European leagues". World Soccer. Retrieved 25 May 2016. ^ "European football statistics". 2008. ^ "Reglamento General de la RFEF 2010 (Artículo 201.2) (page 138)" (PDF) (in Spanish). RFEF. 7 June 2010. Archived from the original (PDF) on 19 May 2011. Retrieved 23 June 2010. ^ "Criterios de puntuación del juego limpio" (in Spanish). RFEF. 30 October 1998. Archived from the original on 7 April 2010. Retrieved 18 May 2010. ^ "Country Coefficients 2017/18". uefa.com. .
^ "1939-50. Years of perseverance". www.fcbarcelona.com. Retrieved 2019-01-17. ^ "El 'Barça de les Cinc Copes' rompió con la furia española". La Vanguardia. 2009-08-30. Retrieved 2019-01-17. ^ "1988-1996. The era of the 'Dream Team'". www.fcbarcelona.com. Retrieved 2019-01-18. ^ Hayward, Ben. "131 to beat - Messi, Suarez & Neymar on target for more goals than ever in third season together | Goal.com". www.goal.com. Retrieved 2019-01-17. ^ "LaLiga - Barcelona: Unbeatable champions: Barcelona win LaLiga with their eighth double". MARCA in English. 2018-04-29. Retrieved 2019-01-17. ^ "Athletic Club - San Mamés (2013)". Athletic Club. Retrieved 2 March 2019. ^ "Wanda Metropolitano". StadiumDB. Retrieved 20 March 2016. ^ "Campanya abonats 17/18" (in Catalan). Girona FC. Retrieved 1 July 2017. ^ "El Alcoraz" (in Spanish). SD Huesca. Retrieved 24 June 2016. ^ Superdeporte. "El Ciutat de Valencia estrena lavado de cara para Europa - Superdeporte". www.superdeporte.es. Retrieved 30 June 2017. ^ "New features for Benito Villamarín Stadium". www.realbetisbalompie.es. Archived from the original on 4 August 2017. Retrieved 29 June 2017. ^ "El estadio - Real Sociedad de Fútbol". Real Sociedad. Retrieved 2 March 2019. ^ "UEFA ranking of European leagues". Bert Kassies. November 2017. ^ "UEFA club competitions press kit (.PDF archive, page 23)" (PDF). UEFA Official Website. Retrieved 25 August 2006. ^ "Clasificación Histórica Liga BBVA". LFP. 21 June 2016. Retrieved 21 June 2016. ^ "Official statement". LaLiga.es. 2015. ^ "La Liga cancels 2016-17 award ceremony". ESPN.com. Retrieved 2018-10-26. ^ "Gareth Bale: The history of the world transfer record". BBC Sport. 1 September 2013. Retrieved 22 November 2014. ^ "World Cup winner Denilson on trial at Bolton Wanderers". Daily Mail. 6 January 2009. Retrieved 22 November 2014. ^ Nash, Elizabeth (25 July 2000). "Figo defects to Real Madrid for record £36.2m". The Independent. London. Retrieved 20 August 2017. ^ "Zidane al Real". Juventus F.C. (in Italian). 9 July 2001. Archived from the original on 6 August 2001. Retrieved 20 August 2017. ^ Ogden, Mark (11 June 2009). "Cristiano Ronaldo transfer: Real Madrid agree £80 million fee with Manchester United". The Daily Telegraph. London. Retrieved 20 August 2017. ^ Wilson, Jeremy (7 June 2009). "Real Madrid to confirm world record £56m signing of Kaka". The Telegraph. Retrieved 21 August 2017. ^ "Kaka completes Real Madrid switch". BBC. 9 June 2009. Retrieved 21 August 2017. ^ "Gareth Bale contract leak sparks panic at Real Madrid - and agent's fury" (21 January 2016). The Telegraph. 21 January 2016. Retrieved 20 August 2017. ^ "Barcelona: Neymar deal has damaged brand of La Liga club". BBC Sport. 10 March 2014. Archived from the original on 22 January 2016. Retrieved 20 August 2017. ^ "Barcelona reveal details of deal to sign Brazil star Neymar". Sky Sports. 24 January 2014. Archived from the original on 11 December 2014. Retrieved 20 August 2017. ^ "Neymar: Paris St-Germain sign Barcelona forward for world record 222m euros". BBC. The British Broadcasting Corporation. 3 August 2017. Archived from the original on 3 August 2017. Retrieved 20 August 2017. ^ "Barcelona signs Ousmane Dembele, its Neymar replacement in more ways than one". 25 August 2017. Retrieved 26 August 2017. ^ Sport, Telegraph (8 January 2018). "Philippe Coutinho's Barcelona debut delayed by 20 days because of injury as he completes £142m move" – via www.telegraph.co.uk.